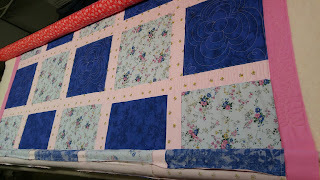 I have three of the five rows done and rolled the quilt forward so I'm ready to start sewing on the fourth row. If you remember, I loaded a double length of backing here so that I could put a second nursing home quilt on right after this one is done. All the tops this year are the same design. 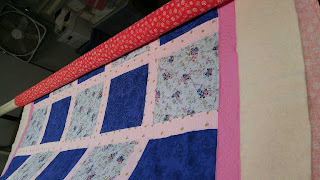 Large squares of two different fabrics with sashing in between. For this first quilt, I did big flowers in the blocks. I am thinking about doing something geometric in the next one.